Lot 592. Q. Minucius Rufus. 122 B.C. AR denarius (16 mm, 3.86 g, 9 h). Rome. 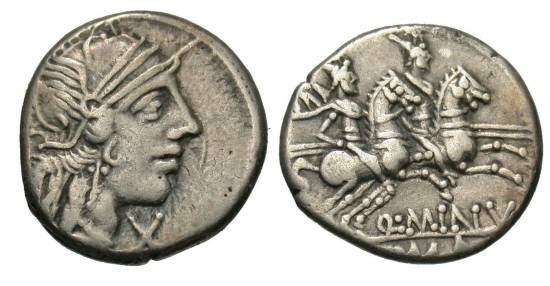 RVF, head of Roma right, wearing winged Phrygian helmet; to right, X / Q·MINV // ROMA, Dioscuri charging right on horseback with couched spears. Crawford 277/1; Sydenham 421; RSC 1; RBW 1099. Nearly very fine.